Bud Williams Stockmanship » Stockmanship in Hawaii! 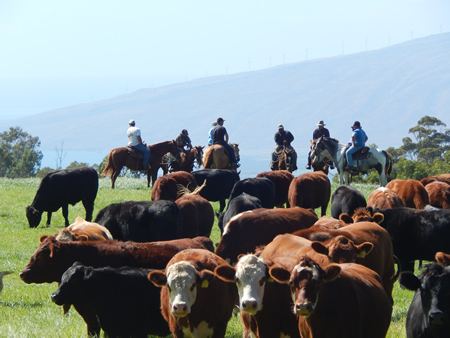 Susan and I completed a stockmanship school here in Maui for the Maui Cattlemen’s and for the Haleakala Ranch- 4 days of training. Riders from the Parker, Haleakala and other ranches attended (about 25). Greg Friel is the foreman at the Haleakala and is to be commended for his efforts to have the whole ranch (and neighboring ones) practicing good stockmanship. His riders are doing a good job already and we took them through getting all the stock calm, driving and turning well and then thru placing and they did place a herd on two occasions successfully. They can’t do rotational grazing with electric fence the way they want because the axis deer wreck it so he wants the riders to place the stock. He has a crew now that can do it and in fact did do it. It was also a good lesson in how a few animals can prevent placing from working, as when Greg sorted off a few of the most sensitive ones, the riding crew got to see how cattle can handle so well when its done Bud’s way. It was really a pleasure to work with men so interested and dedicated to good stockmanship and the land and their animals.